Since blogging on WordPress, I have encountered a number of interesting blogs written by fellow bloggers. 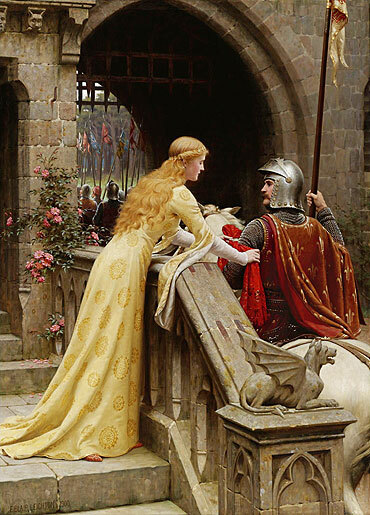 One post that provoked some disagreement was ‘Chivalry – it’s not just for knights’, written by author, Stephen Liddell. Whilst I respect Stephen’s views on the matter, I must confess that my views do not coincide. Why should one gender be treated differently to the other when it comes down to something that, essentially, should be nothing other than good manners and common courtesy? From a female perspective, the underlying patriarchy of chivalry has always sat uneasily with me: The implication that men are the strong protectors, who tend to the perceived weaker gender, like a knight in shining armour. Feminists argue that chivalry is, therefore, misogynistic, but I disagree with this view entirely. Misogyny is defined as being a “hatred, dislike, or distrust of women”, and even if men really are chivalrous as a result of their inherent beliefs that women are weak (as the feminists claim), I fail to see the correlation between the belief that someone is frail, and hating them. A newborn baby is more fragile than a fully-grown adult; does that mean that we nurture and protect a child who is so precious to us, purely out of hatred? Such feminist theories are preposterous, and as such, do not stand any validity in forming a well constructed argument or reason. Chivalry may very well be patriarchal, and exasperating for women such as myself, but it is surely not a feature of misogyny. On average, men are only about 15-percent larger than women, although the average male is usually physically stronger than most women, because of greater muscle mass. Of course, there are exceptions, and even if a woman is physically weaker than her male suitor, that does not make her too frail to open a door for herself, or to stand during a train journey. Women such as the suffragette, Emily Davison, died in the fight for female equality in our history; so what a kick in the teeth to the memories of women who fought for equality, when there are still some instances of women being perceived as the “weaker” gender, so many years on. Perhaps such patriarchy is the result of modern women demanding they be “treated like queens”, just as much as men are at fault for bestowing it upon women whilst, quite hypocritically, failing to treat their fellow men with such good manners. When a sports injury necessitated the use of crutches last year, I was admittedly, very grateful when a seat was offered on public transport, and was genuinely touched by the number of kind people who would stop and offer to help – both men and women. Usually it was men who offered to help, and I could not help but wonder how many of them would have been so helpful had I been male. No doubt the men who stopped to offer help, believed they were just being kind, and maybe they really would have been as helpful towards a male as they were towards a female. But, as Steven Liddle wrote in his blog, “I do it for me” – Is such a statement not a form of moral superiority, whereby the person is rather egotistically making the gesture, merely to make himself believe he is the “good guy”? I cannot help but object to, what is essentially a patriarchical moral high ground, particularly as good social etiquette dictates the obligation that I should graciously say thank you for something I neither wanted, nor asked for, but was imposed upon me nonetheless. Being a humanist (as opposed to a feminist), I advocate equality between both genders. Men should be treated the same as women, with good manners bestowed upon both genders – and not forgetting the transgendered, too. When a man runs to hold a door open a door for a woman, or offers to carry her bags, then he should offer the same to a fellow male. If a woman is genuinely in a position where she appears to be in need of help, such as being on crutches and struggling to carry heavy bags, or may need a seat; then yes, by all means offer her help – but also offer the same assistance to a man on crutches. I certainly would, and very often have, much to the surprise of the men in question. With regards pregnant or elderly ladies (and elderly men!) unsteady on their feet; yes, a physically healthy man should give up his seat – but so should other women who are not pregnant, elderly, or less physically able to stand (I.e. on crutches or recovering from surgery, etc.) It is a matter of priority and common courtesy. My message to all the “Knights in Shining Armour” out there: Instead of behaving in a chivalrous manner, try being an all-round decent human being instead. People will respect you for it more. My little anti-feminist joke of the day!